If there is a reason why you should buy the DJI Mavic drone, it is for its excellent 4K high quality videos, just like its predecessor in the DJI line of drones. Coming hot on the heels of the DJI Mavic Pro, the Mavic Air has seen many improvements. Among the most notable things is the size. Now, the Pro had a small compact size, but the Air goes a few notches smaller. Who would have expected this to happen? If you love traveling with your drone, you will love the Air as it occupies a small space on your backpack. Above all, you will love the awesome pictures and videos that you can shoot in the outdoors and on your travels. But that is not all the improvement that you will get on the Air. It is also lighter and smaller in size and it is also much more affordable. The Mavic Air measures 168mm by 83mm by 49mm when folded. They do not come any smaller or more compact than that. It weighs 430 g only, this is one of the consumer drones that you do not have to register with the FAA since it does not reach the weight limit. It comes in a dashing red color, makes it hard to miss when it is flying and makes it look handsome. 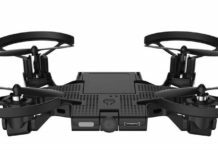 The legs of the drone fold nicely, turning this into a very portable drone. Obstacle detention – This drone has an obstacle detection feature, which can “perceive” obstacles from 20 feet away. This is an advancement because the Air’s predecessor is only able to detect obstacles from 15 meters away. 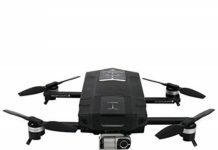 This drone uses Mavic’s best software (Active Track) that collects data about the surroundings where you are flying it. It will then create a map of the obstacles and uses it to avoid anything that is not below or above its flight path. Note that this feature cannot see glass or thin branches, so be mindful where you fly it. Flight time – The flight time of the DJI Mavic Air drone is 21 minutes – give or take a little. This is much longer than many other consumer drones in the market. The drone uses a small Lithium polymer battery, which is small and light, but as you can see from the flight time, it still does a great job. 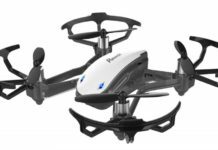 Still about the camera, this drone comes with a feature that helps to smartly adjust the photos that it shoots so that they can come out in the best light possible even when taken in poor lighting conditions. So this camera comfortably takes great photos even in poor or low lighting. Storage – One of the worries of many people looking for consumer drones is where they will store the photos and the videos that they shoot. While many drones in the market transmit the photos to your smartphone through an app or Wi-Fi, the DJI Mavic Air drone has an internal storage of 8GB. That is not much, but then there is a slot for a microSD card for expanded storage. Should you save your videos and photos in the drone memory, you can transfer them later to your computer through the USB port. Control – The remote control for this drone does not have a screen, thus making it much smaller than the predecessors. You will realize that as soon as you take your hands off the joysticks, the drone will just stop and hover, a feat that many small drones of its size cannot achieve. With advanced positioning systems and sensors, the drone will be in your full control. Also, you can use your smartphone to control the drone. Just download the DJI GO 4 app for android or iPhone and launch it. Other features – FlightAutonomy 2, Advanced Pilot Assistance and Intelligent RTH (Return-to-Home) all make sure that your drone is safe. Active Track as discussed earlier ensures that your drone avoids obstacles that are not above or below its flight path. The drone camera can create 32 MP Sphere Panoramas. This feature has been included to enable this drone to stitch 25 photographs together in about 8 seconds. I am a beginner drone enthusiast and I love this one to the moon and back. I am learning the ropes everyday and I am impressed by the features. Gerald L.
I love flying the Mavic Air. Flies like a marvel and looks good in the air. However, I find it a bit louder than its predecessor. Kimberly J.
I took this drone with me to Kenya and I have great shots from that country. Packing it in my travel gear was no biggie and I shot so many photographs and videos I had to use a second memory card. 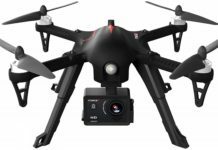 Hellen N.
Having used the Mavic Pro and now the Air, I can confidently say that the Air is so much better with better features, smaller and even the price is lower by more than $200. I love this drone. 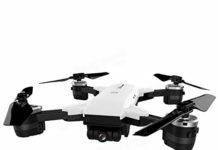 Aaron P.
Who Should Buy DJI Mavic Air Drone? The DJI Mavic Air Drone is a perfect drone for beginners as well as advanced pilots. It has incredible features that make it a delight to fly. 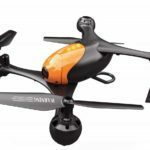 If you are looking for a drone that you can cut your teeth on and one that you will stay with even after you become an advanced pilot, this is it for you. 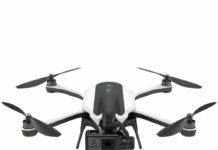 If you love traveling and would want to take awesome videos and photos of new places and new people, buy this drone. It will give you more than enough value for your money. For people who know drones, they understand that Mavic is a must-have in their collection and the Air is best because of the advanced features and affordable price. 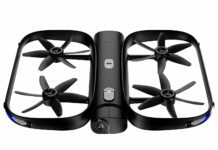 Having seen the affordable price of this drone and the number of features that it comes with, you will be glad that you had the opportunity to fly the DJI Mavic Air Drone. All this goodness is packed in a small, portable and easy to fly drone. 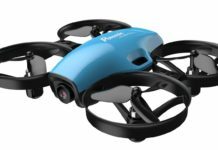 This drone is small, yet feature-packed, with good flight time and it can shoot incredible photos and videos. The general sentiment is that once you buy this one, you will have a great time with it and may never have to upgrade to a higher version. Show me the price !